Your body is designed to be in a relaxed, healing state the majority of the time. These days, however, most people spend the best part of their day in a state called the fight or flight response, in which your body can’t heal or repair. This physical response is nature’s way of keeping us safe and was designed to be triggered when we encounter life-threatening danger. But in today’s fast-paced world, fight or flight is set off multiple times a day by worry, over stimulation and a new pressure to multi-task. It starts with a rapid release of stress hormones for instant energy (so you can fight or flee) but then later leaves you feeling lethargic and hungry, one of the reasons stress can cause weight gain. When you are stressed you may experience many different feelings, including anxiety, fear, anger, frustration and depression. These feelings can feed on each other and can themselves produce physical symptoms, making you feel even worse. Your brain copes with fight or flight by producing more of a high intensity brain wave frequency known as Beta, and suppressing the more relaxed Alpha and Theta brain waves. Once your brain familiarises to this new stress pattern, it becomes difficult for you to wind down. You may experience insomnia, poor memory, lack of motivation, negative self talk, weight gain, low energy or all of the above. Briantap is an innovative system used to deliver Self Mastery Technology (SMT). 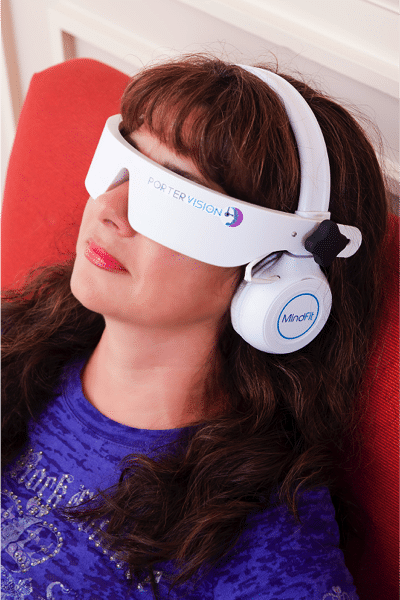 This transformational technology combines gentle pulses of light and sound with visualisation and soothing music to return you to the right balance of brain wave activity. A simple 20 minute session produces the relaxation response, a state known for reversing the ravages of stress, reducing worry anxiety and providing the same benefits as 3-4 hours sleep. Produces the brain’s relaxation response. Balances the brain, inspiring focus & creativity.